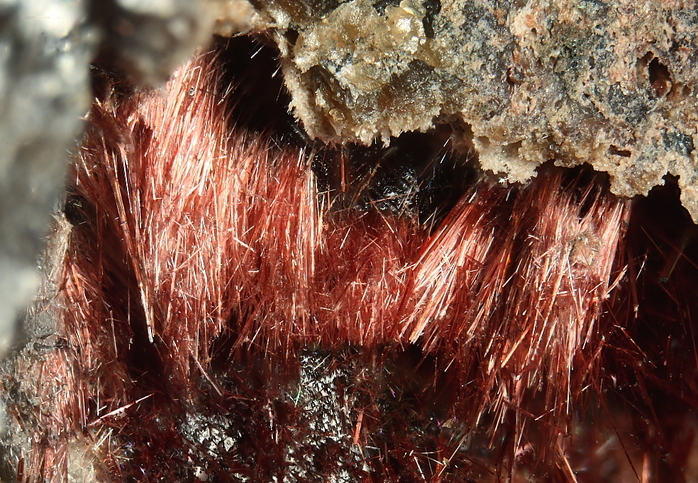 Namansilite: Mineral information, data and localities. For the principal constituent elements: sodium (natrium), manganese, silicon. Pyroxene Group - Clinopyroxene Subgroup. Braunite 8 photos of Namansilite associated with Braunite on mindat.org. Pectolite 3 photos of Namansilite associated with Pectolite on mindat.org. Quartz 3 photos of Namansilite associated with Quartz on mindat.org. Noelbensonite 2 photos of Namansilite associated with Noelbensonite on mindat.org. Gonyerite 2 photos of Namansilite associated with Gonyerite on mindat.org. Cerchiaraite-(Mn) 1 photo of Namansilite associated with Cerchiaraite-(Mn) on mindat.org. Pyroxmangite 1 photo of Namansilite associated with Pyroxmangite on mindat.org. Ohashi, H., Osawa, T., Tsukimura, K. (1987) Refinement of structure of manganese sodium dimetasilicate. Acta Crystallographica: C43: 605-607. Basso, R., Lucchetti, G., Palenzona, A. (1989) Crystallographic and chemical study of a natural C2/c ordered Na-Mn-clinopyroxene from Val di Vara (Northern Appenines, Italy). Neues Jahrbuch für Mineralogie, Monatshefte: 59-68. Kawachi, Y.,Coombs, D.S. (1993) Namansilite, NaMn3+Si2O6: A widespread clinopyroxene? Mineralogical Magazine: 57: 533-538. Jambor J.L., Vanko D.A. (1993) New mineral names. American Mineralogist: 78: 1314-1319. (1994) Neues Jahrbuch für Mineralogie, Abhandlungen: 168: 1-13. Oberti, R., Boiocchi, M., Hawthorne, F. C., Ball, N. A., & Ashley, P. M. (2016). PREPUBLICATION: Oxo-mangani-leakeite from the Hoskins mine, New South Wales, Australia: occurrence and mineral description. Mineralogical Magazine. 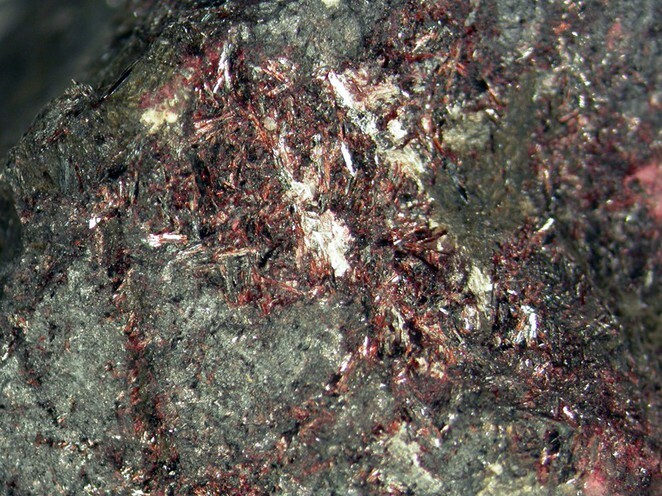 Uehara, S., et al (2014) MInerals from Kyushu and Yamaguchi. 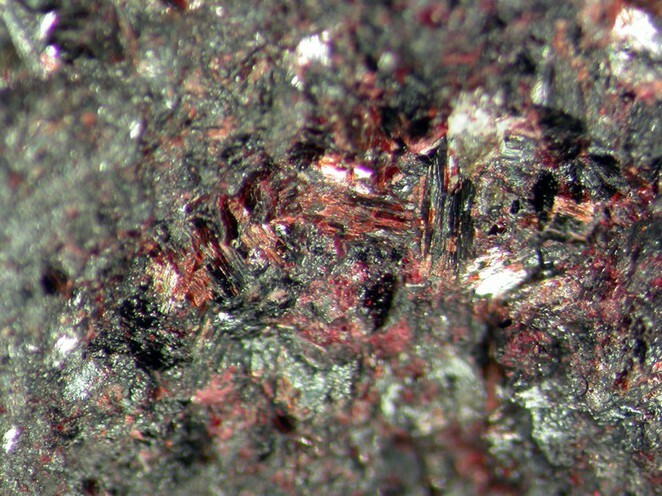 (Fukuoka Mineral Club, 355 pages); Nishio-Hamane, D., Ogoshi, Y., & Minakawa, T. (2012). Miyahisaite, (Sr, Ca) 2Ba3 (PO4) 3F, a new mineral of the hedyphane group in the apatite supergroup from the Shimoharai mine, Oita Prefecture, Japan. Journal of Mineralogical and Petrological Sciences, 107(3), 121-126.